We must ever be friends; and of all who offer you friendship, let me be the first, the truest, the nearest and dearest. 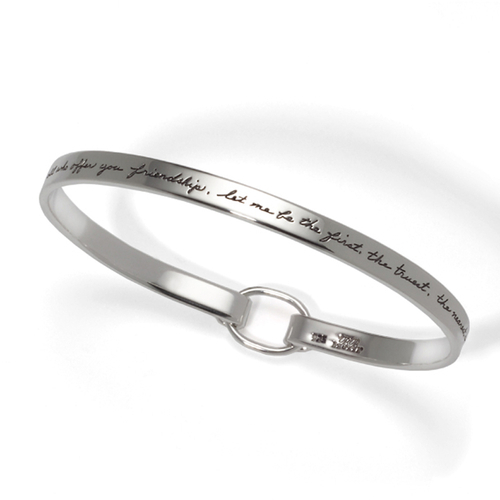 This hand-polished sterling silver bracelet shines as bright as the love you share with your best friend. A delicate oval link connects each half of the smooth circle to demonstrate your special connection. Distinctive engraved handwriting adds an extra-special touch. It makes a wonderful gift for the woman who is always there for you, who truly understands you, and who you know you can count on in good times and bad. This quote also holds a special meaning for friends who want to pursue a deeper relationship. It comes from Henry Wadsworth Longfellow’s ballad The Courtship of Miles Standish, published in the 1800s. In this poem, a young man is sent to deliver a marriage proposal to a woman. But he doesn’t want to deliver the proposal message because he himself is smitten with her. Overcome with emotion, he delivers a promise of eternal friendship.